ILO 200 ccm, 10 HP, fan-cooled engine with dynastarter and -generator. 3 forward gears and 1 reverse gear, long-distance-Autobahn (highway)- speed 75 km/h, top speed 85 km/h, rear wheel drive: 1 wheel driven by chain. Steel tube frame. Front suspension: steel tube axle with front strut rods, axle and steering fastened with silentblocs, rubber "springs" fastened to the body directly above the center of the axle. Rear axle: one wheel suspended by steel tube swing arm fastened with silentblocs, bearing point near the center of the chain sprocket, rubber springs. Steering: rack and pinion with split tie rod. At all (3) wheels, actuated by cable, parking brake at front wheels. 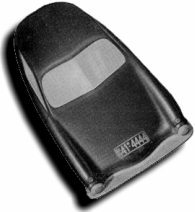 streamlined coupé, alloy body (E53), one-piece, curved windshield, sliding door windows, large rear window. 2 and 1/2 seats, spring suspended unholstery, dashboard: speedometer,ignition switch, headlight beam control switch, direction indicator switch, fog lamp switch, windshield wiper control switch, starter knob, charge control lamp, ash tray, rear view mirror, interior lighting, large luggage compartment, spare tire. wheelbase 2060 mm, tread 1200 mm, vehicle overall length 3425 mm, vehicle overall width 1420 mm, weight 280 kg. The last survivor? The body shop that built the few original Pinguin bodies, Johannes Rudy (Delmenhorst), also made this toy car. Do you have any information or literature about this pedal car? I heard there's an obsolete book about german body shops that covers the Pinguin cars AND this toy. Is there any real Pinguin bubblecar left?